Paper trading, or using stock trading simulation software, allows new investors to test the waters before jumping in. Paper trading software simulates stock trading under real world conditions, but real money isn’t required – in other words, its virtual trading platform. Many investors use paper trading software to educate themselves before they start live trading. Even some professional investors use paper trading software to test new strategies and ideas. There are many paper trading software platforms nowadays that financial services firms can easily adapt and offer to their clients. 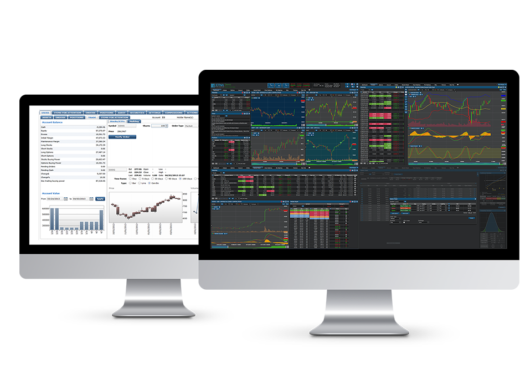 Some trading simulators are available for private labeling and offer ready-to-use paper trading capabilities. They may provide as well new content for current and future customers along with powerful stock simulation tools. So, let’s see why and how an online brokerage firm, or financial services institution can use paper trading? Investing in stocks can be intimidating and at times even harrowing for new investors. Many new investors worry they’ll suffer steep losses or that their strategies will fail. Others simply don’t understand how investing in stock market works. For the uninitiated, stock trading has a high learning curve. Still, investing is vital for wealth management and prosperity. Those who don’t invest their funds will see their wealth reduced by inflation. A dollar in 1990 was worth about twice as much as a dollar today. And a dollar today may be worth half as much as a dollar thirty years from now. Investing, however, can help investors big and small beat inflation. How can you get potential investors to sign up? The answer is paper trading, which refers to stock trading simulation software. Basically, would-be investors can use virtual money to invest in stocks. This allows them to test the market and their strategies without having to risk hard earned money. There are far too many investment methods and strategies, from day trading to value investing and everything in between. Some investors stick to a few industries, others try to build a diverse portfolio. Many new investors are well aware that there are many different strategies, and many of them have ideas they want to test out. Stock simulation software allows them to do so. And since money isn’t on the line, many investors are quick to test strategies and to make bold moves. This helps them grow into confident, decisive investors, and ones who could potentially earn a tidy sum in the long run. At the same time, they’ll have ample opportunities to learn from their mistakes, but won’t lose their life savings while doing so. Paper trading also allows potential clients to test out your own system and services. Let’s say you offer high-end market research reports that savvy investors can use to get a jump on the market. But how do potential clients know your reports will produce results? Why not grant them access to your reports during a trial period, and allow them to use a paper trading platform to test concepts out? As investors see positive results, they’ll be more likely to convert to paying customers. Using paper trading software is a great strategy for wealth managers and professional investors to showcase their services. You can use the software to hook potential customers, offering them guidance and tips, while they trade with the stock simulation software. Building trust is essential for every wealth manager. Paper trading allows you to prove your value, while potential clients don’t have to risk money. Even if your wealth management firm is already enjoying plenty of success, can help you grow. Or maybe you just want to show how easy your user interface and experience are to use, or how well your charting software performs. Fact is, there are now many different stock trading platforms and investing services. This competitive market is great for customers as they have a plethora of choices. However, it’s difficult for investment services companies to attract an audience, especially if they don’t have a huge marketing budget. How do you convince potential customers that your user interface is the easiest to use? How do you convince them that your user experience is top notch? Paper trading software will allow you to show off your services without forcing your customers to have to pay up first. This lowers risks and barriers. There’s also the issue of accessing ‘digital natives’ audiences like millennials and generation Z. Now the largest cohort in the United States and many other countries, millennials are tech savvy but highly reluctant to invest. The Great Recession of 2008 is responsible for much of their apprehension, with millennials growing up and entering the workforce amid the biggest financial meltdown in decades. Paper trading software is great for reaching out to millennials and teaching them that no, investing is not all risk, no reward. As millennials practice investing, many will come to realize that they can generate substantial returns on their activities. Further, being tech savvy, millennials will come to learn how comfortable online stock trading can be. While older customers can be technology-resistant, millennials are often the opposite. Once they realize how easy tech-enabled stock trading is, they’ll be more likely to trade. Millennials are often cautious customers as well. They’re resistant to sales pitches, wary of marketing, and are well aware that companies are out to make a buck. With simulation software, millennials can skip the sales pitch and try investing for themselves as is. When it comes to converting millennials, there’s often no better sales method. Current customers can benefit from paper trading software as well. Many investors limit their investments to small amounts of risk capital. Or if a customer is burned by a bad investment, they may pull out of the market. However, with paper trading software, they can continue to practice investing, minus the risks. Paper trading is also great for current customers who want to test new ideas or start trading new asset classes. Maybe a value investor wants to try some higher risk investing in penny stocks, or perhaps a day trader is looking to lower risk in his/her portfolio. Moreover, you can take advantage of gamification to launch trading competitions or games among current investors to find who is the fastest, most socially responsible or risk averse investors. Such things increase customer interaction with the brand, and as a result the level of loyalty improves too. Given all of the above benefits, it should come as no surprise that many of the most well-known online brokerage firms and investing education websites offer stock simulation software, usually for free. However, paper trading isn’t limited to big companies. Thanks to technology vendors like ETNA, paper trading solutions are ready to use and available for private labeling. It’s even possible to plug white labeled stock simulation software into your real time trading system. Offering paper trading platform brings more business to online brokerage firms. Curious to learn more about paper trading solutions by ETNA? Send us a message and we will gladly answer your questions.